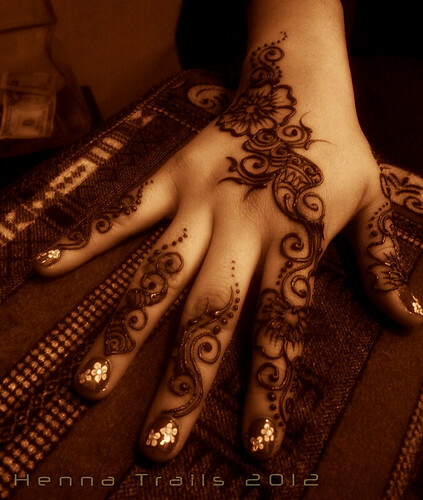 henna , a photo by Henna Trails on Flickr. Ah, my henna season 2012 began last Thursday April 5th! I am so very glad to be working again. Downtown Chico, California hosts an evening market called, the Thursday Night Market. Downtown streets are closed for the evening, farmers, food makers, artisans and musicians will come together for the next 6 months for our community. It is events like this which keep my artistry moving. This will be my 4 season, I have come a long way from my beginning days. This design I am calling the “Bollywood special”, it is one of my most requested designs. Each one is different from the other, simply done with a floral strip and finger accents. The years previous I referred to it as the “Sangeet special” as it is something along the lines of a design you may recieve at a Sangeet as a guest. However, many of my clients aren’t aware of what a Sangeet is, and Bollywood is a term they can relate to. I have found the people drawn to henna in my tent are wonderful, open minded individuals. I really love my job and everything around it. Thank you! hennahennahennnahennnahennaaaa♥. Beautiful, how I wish there were henna artists in my home town Vienna – if there are any , they are very rare! Not brave enough to try this, but they are absolutely gorgeous. Thank you for your recent visit and follow. Look forward to sharing across our blogs.